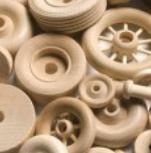 Our unfinished wood toy wheels are a perfect match when working with wooden toy parts to craft that perfect toy car, train, or toy trucks. Whether painting or staining, building heirloom toys to quick craft projects, every toy wheel is of a high quality. Made from hardwood, every wood toy wheel is an excellent component for creating safe toys. Our toy wheels are often colored with food safe dye to give your toys a colorful look.